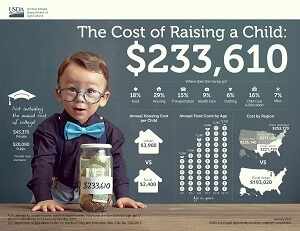 The U.S. Department of Agriculture (USDA) released the “The Cost of Raising a Child” report that estimates that for a child born in 2015, a middle-income married-couple family will spend between $12,350 and $13,900 annually (in 2015 dollars) – or $233,610 from birth through age 17 – on child-rearing expenses. Many state governments use this annual report, first issued in 1960, as a resource in determining child support and foster care guidelines. Housing and food account for the largest share of child-rearing expenses, followed by childcare/education, transportation and health care. Clothing was the smallest expense. This report does not include costs related to pregnancy or college costs. For the purposes of this report, a middle-income family is defined as the middle third of the income distribution for a two-parent family with children. View the full report or access infographics for more information.